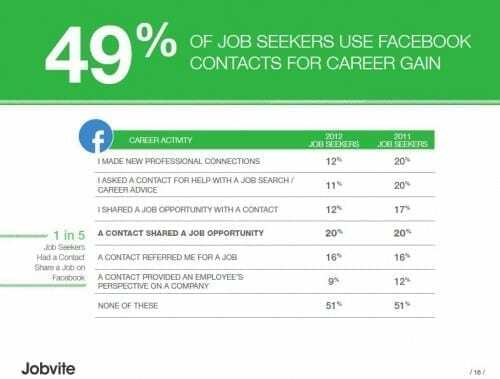 Social Job Seeker, Jobvite’s newest survey, asked job seekers how they used social networks for career advancement and job search. If you are actively or passively seeking a new opportunity, these points will help you understand how to be more pro-active in your search. Most companies hire people primarily through referrals, therefore, job search activities need to match. Focus your energy on making contact and building relationships with company insiders at specific, targeted companies. Jobvite’s study reports 69% of employed American’s are seeking or at least open to a new job. They call them job seekers. Let this be a warning to all companies! Your employees want to leave you! The real value of social networking is the ability to connect and engage with people. Many people new to using social networks believe “if they build it, they will come!” While that CAN happen, the true value of social networks happens when you connect with people, mine your network for meaningful industry data and trends (not job postings), and ask for advice and information. 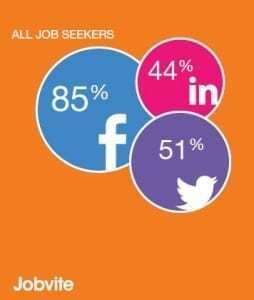 What Actions Do Job Seekers Take On Social Networks? According to the responses to how job seekers are using social networks, the majority of respondents are using the first four actions. These are reactive job search actions. No wonder they 61% found it more difficult to find a job today. They are engaging in the most competitive, congested, and less productive activities. Fewer job seekers were using social networks to research or connect or even source a recruiter. Researched a potential employer before/ during application process. As a matter of fact, the responses to the “none of these” questions were quite high across all three social networks: 48% on Facebook, 62% on LinkedIn, and 66% on Twitter. More than half of people with social network profiles are missing opportunities to use social networks and are not really users of social networks, but takers! And it seems odd that while 20% reported receiving a job lead from someone on Facebook, only 12% reported sharing job leads themselves. They must have missed the “give to get” message. 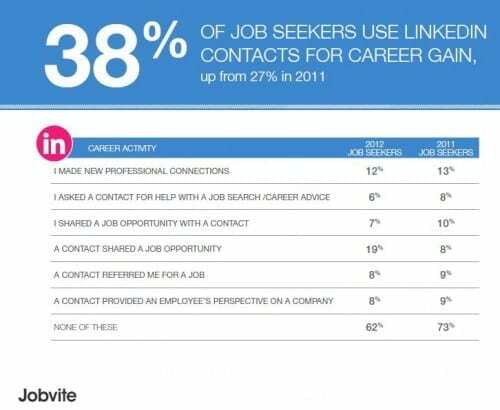 62% of job seekers with LinkedIn accounts are NOT using it for career gain. Acquiring inside information and referrals is the name of the game. Chasing posted job opportunities is highly congested, a better goal is to establish connections before the opportunity arises. Networking is a lifetime activity and not one that is used merely to find a new job. 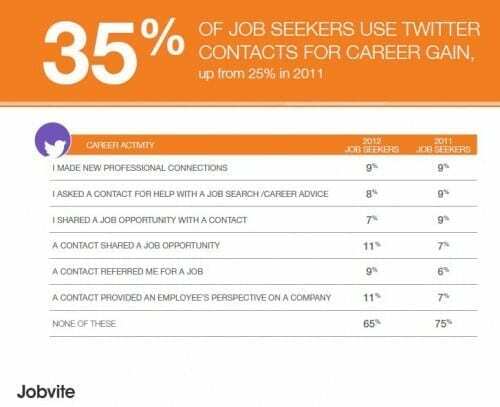 65% of respondents reported they did not use Twitter for career gain. While they did receive referrals and job leads, only 7% shared leads themselves. The good news here is that 11% of Twitter users reported asking for insight on a company. There are certain strategies social networking power-users and great marketers use to build community and it starts with creating relationship and building trust. It would benefit all job seekers to learn how to use these strategies to improve how they are leveraging the power of social networks. Give to get. In other words, help others more than you promote yourself. Uncover the needs and wants of potential customers, clients, employers and develop a campaign to reach them. Build a tribe! Partner with organizations and people who believe in you and will help distribute your message. Systematically and purposefully grow your network with people who can help. Ask for advice and help! Be authentic but don’t be vulgar. If you consider yourself a business of one, these actions should make sense. If, however, you consider yourself merely an employee looking for a job, these strategies may be difficult for you to embrace.